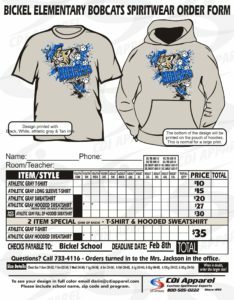 Bickel is selling spiritwear to help fund school activities through the PTA. Consider purchasing one of the many items that represent our amazing school by filling out the form sent home with your student this week. Payment and orders will be due by Thursday, February 8th to the front office.